A romantic, Zen bedroom is a serene and restful space. Although Zen -- as used in design -- is Asian-inspired, it doesn't have to feature any hint of Asian decor whatsoever; the key points to focus on are balance, harmony and above all simplicity. There is no right or wrong when it comes to designing a Zen bedroom, it should be whatever comes to mind for you personally when you think of the word "Zen." A Zen bedroom should be simple and relaxing, yet warm and welcoming. Paint the walls. Use light blues and greens for a calming, restful effect; use white to create a serene and peaceful space; or use neutrals such as creams and browns to create a natural, earthy atmosphere. Lay wood flooring for an authentic Asian feel. Alternatively, use a natural-fiber carpet such as seagrass, sisal, hemp or jute. If you cannot change the existing flooring, in a rented property for example, cover it with a large-natural fiber rug. Use the absolute minimum of furniture. Zen design doesn't feature accent or decorative furniture pieces; if it doesn't serve a specific purpose, leave it out. Choose pieces with simple, clean lines and no elaborate embellishment. Add a low, futon-style bed, positioned in the center of the wall to create a sense of balance. Place matching tables on either side for a symmetrical effect. Place identical lamps on each bedside table. Hang an Asian-style wall hanging above the bed, featuring a romantic scene such as an embracing couple. Dress the bed with simple bedding in natural materials such as linen and cotton. Transform it into a romantic and inviting place with the addition of silk or satin cushions and throws. Fit bamboo blinds at the window. Soften the effect by draping a soft, sheer fabric over a curtain pole and allowing it to gently cascade to the floor. Display artwork featuring words such as "Love" and "Peace" in Japanese, or Benzaiten, the Japanese goddess of love and beauty. Place this artwork opposite the bed, to balance the wall hanging. Keep accessories to a minimum. Display a single red faux orchid in a tall vase. This adds a splash of romantic, passionate red to the room without being too stimulating and ruining the serene, calming effect you have achieved. Mason, Tami. 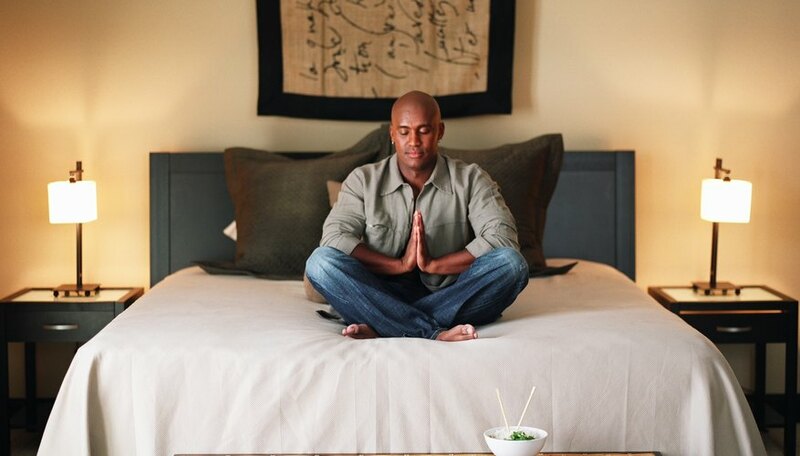 "How to Make a Romantic Zen Master Bedroom." Dating Tips - Match.com, https://datingtips.match.com/make-romantic-zen-master-bedroom-12079904.html. Accessed 24 April 2019.